“la Caixa” has installed the world’s first ATMs to feature the “contactless” technology developed by Fujitsu. These machines allow customers to quickly and easily perform routine financial transactions. Contactless cards need not be inserted into the ATM card slot before transactions can be performed. Instead, users need only wave their cards next to the reader and enter their PIN number to operate the ATM. According to technical figures, this is the fastest ATM cash withdrawal system on the market. The first “contactless” ATMs were installed in the 22@ district of Barcelona, the city’s innovation and technological hub, in Sitges and in central Palma. For the first few days the cash withdrawal function will be available. Further such ATMs will be installed at other locations around the Balearic Islands and Catalonia, while the range of compatible services and functions will also be extended. 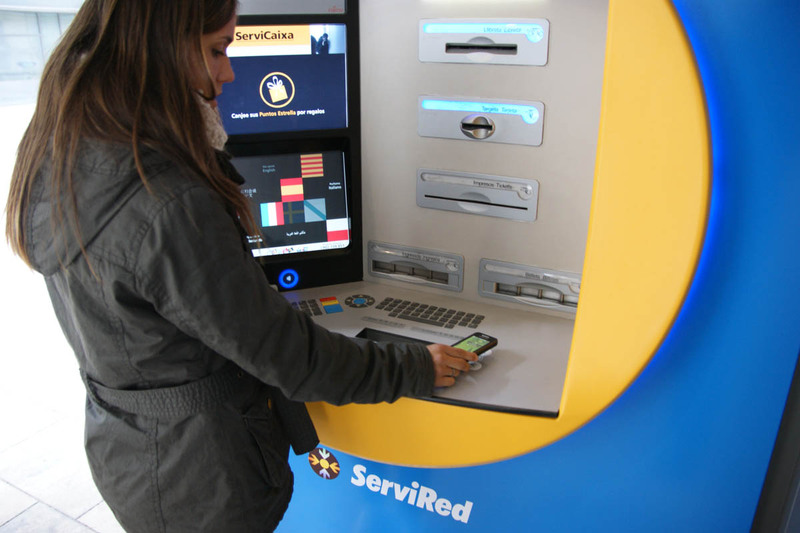 This innovation, designed to make ATM transactions faster and more convenient for users, makes “la Caixa”, chaired by Isidro Fainé and managed by Juan María Nin, the first financial institution to roll-out commercial services using “contactless” technology, and represents further progress in the bank’s commitment to identifying innovative technology to improve the services provided to customers. The ATMs featuring contactless technology are also adapted to work with all existing contactless payment methods, such as NFC-enabled mobile phones (Near Field Communication), as used in the initial mobile payment systems made available in the town of Sitges. “la Caixa” and Visa Europe recently unveiled Europe’s largest regional launch of contactless payment systems, on the Balearic Islands. “Contactless Shopping” is Spain’s first large-scale roll out of the new international payment technology. Customers can also use contactless cards to make quick payments at stores, simply by waving their contactless cards next to the store’s dataphone. To date, no other European bank has rolled out contactless systems on such a large scale. The contactless system is fully secure, protected by the CaixaProtect guarantee. This coverage protects all “la Caixa” card users against any possible fraudulent use of electronic payment methods. The new contactless ATMs from “la Caixa” and Fujitsu represent a further step forward in the strategy of improving customer services through innovation. “la Caixa”, with some 8,000 ATMs, has the largest cash machine network in Spain’s financial system and the second largest in Europe. Furthermore, the new “la Caixa” ATM model features all the latest developments in usability and accessibility. For example, the machines feature twin screens; one for transactions and the other for operational and commercial support, making for a much more user-friendly interface. Their banknote recognition technology also allows instant cash and cheque deposits. “la Caixa” has also made major efforts to optimise service accessibility. “la Caixa” ATMs are adapted to the Braille system and feature voice software for the blind. The machines also include an option to enlarge screen text size for the visually impaired. Customers who suffer from hearing difficulties can make use of sign language videos. The bank was recently awarded the Discapnet Prize, in recognition from the ONCE Foundation for its outstanding work in improving ICT accessibility. “la Caixa” is Spain’s leading financial operator in terms of overall mobility services. The bank manages more than 6.62 million online banking customers, over 1.8 million mobile banking customers and 10.34 million cards.